Hi everyone and happy Monday. Today was the first day of school for my kids. Oh what a bittersweet day for everyone. All the excitement for brand new school year. My kids are excited and scared all at the same time.I was so excited for the first day, but have to admit the silence in our home is no fun at all. I look so forward to it and then when it finally gets here it's a bit sad. I can say today has flown by and I hope my kiddos are having awesome first day. I shared a photo on my face book fan page of the kids first day of school. Before bed last night we packed up all the lunch boxes and laid out all their school clothes. I'm so glad that we packed the lunches ahead of time because it was such a time saver this morning. Last week while I was working on my Back to School Lunch Box Idea's post. I started thinking about all the fun items that I could place in the kids sandwich keepers. One idea that popped to mind was making my own Homemade Pizza Lunchables. The pizza ones are Carson's favorite of all the Lunchalbes. I prepared a batch of my no fail pizza crust and got started. I had everything on hand so that made it really easy. My kids thought I was nuts attempting such a thing.My daughter said mom why are you making those when you can just buy them at the store? I told her because those can get expensive so I want to try and make them myself. 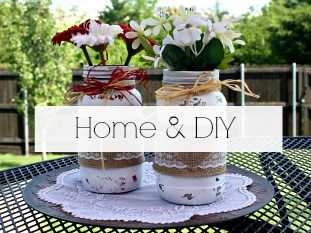 The whole process from start to finish was really easy and not time consuming at all. I got about 20 pizza rounds from one pizza dough recipe. Pretty good if you ask me. The best part is they tasted just like the real deal. Look how cute they look in the little sandwich containers. I have included some step by step photos below to show you how easy these homemade lunchables are to make. This might not be for everyone, but if it's for you then I think you will enjoy this post. Prepare pizza dough according to recipe. 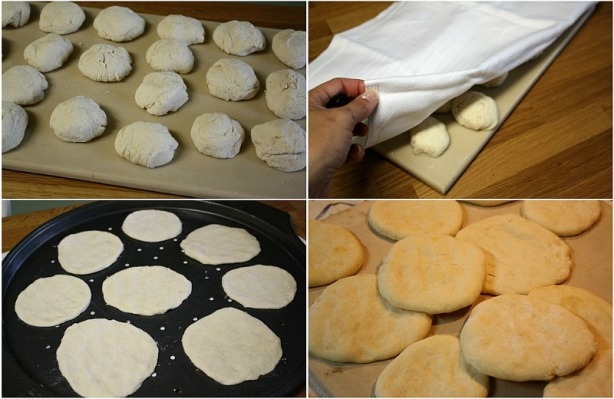 Separate dough into 18-20 golf ball size pizza dough balls. Set aside and let the dough rest for about 10 minutes. Preheat oven to 400 degrees. On a floured surface roll out each pizza dough ball into a 5 inch circle. Place each pizza round on a pizza pan or baking stone. Using a fork prick a few holes to keep the dough from bubbling. Bake for 8-10 minutes or until the bottoms are very lightly brown. Remove from oven and let cool before removing from pizza pan. When completely cool place in a gallon size freezer bag and store in the freezer until ready to use. 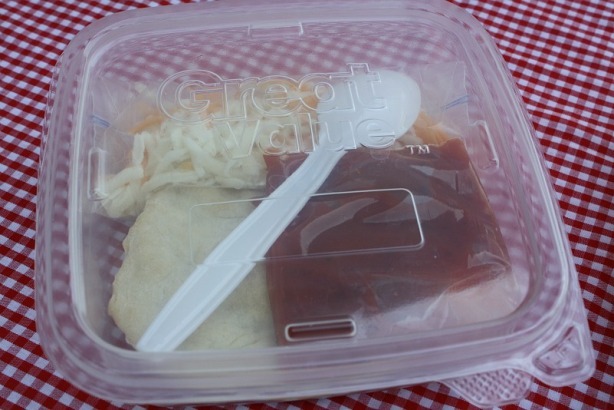 To assemble Lunchables add two pizza crusts to a plastic container with a lid. Add about 2-3 tablespoons pizza sauce to a snack size zip lock bag and seal (I fold in half). Add mozzarella, cheddar cheese and pepperoni if using to a second bag and seal. I added about 1/2 cup cheese. Place everything into a plastic container (I use the Great Value Sandwich Containers) and place a plastic spoon inside to spread the pizza sauce. Close or snap shut and add to your child's lunch box. Let your child assemble their lunchable at school and enjoy!!!! My kids said they taste just like the real thing . Score for mom!!!! Prepare pizza dough according to recipe. Preheat oven to 400 degrees. On a floured surface roll out each pizza dough ball into a 5 inch circle. Place place each pizza round on a pizza pan (brushed with olive oil) or baking stone. Using a fork prick the pizza rounds a few times to keep the dough from puffing up. Bake for 8-10 minutes or until the bottoms are lightly brown. Remove from oven and let cool before removing from pizza pan. Add two pizza crusts to a plastic container with a lid. Add about 2-3 tablespoons pizza sauce to a snack size zip lock bag and seal. Add mozzarella, cheddar cheese and pepperoni if using to a second bag and seal ( I used about 1/2 cup cheese). 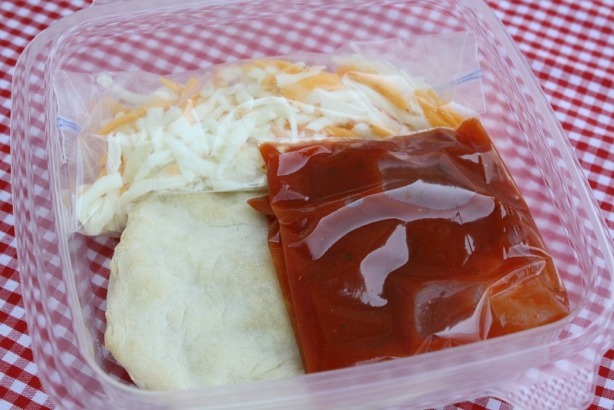 Add everything to the plastic sandwich container and place a plastic spoon inside to spread the pizza sauce. Close or snap shut and add to your child's lunch box. Oh, I LOVE this idea!! I don't buy Lunchables, they usually contain something or other that my daughter doesn't like. This is a perfect substitute! Thanks! Great idea. Lunchables are a rip off. So expensive for such a tiny amount of food.But kids love them. I agree they do love them and they do come in handy for school lunches. Especially when you are in a pinch for time. Great idea, my son loves these! WOW! Why did'nt I think of this?!! My newly first grader LOVES those lunchables too. Thanks for this post I will be trying this out!!! Just yesterday I was hunting for a crust substitute to make homemade pizza Lunchables. I'm definitely going to try this. This is a wonderful idea, love it! I do not buy lunchables and I homeschool..but I love an easy lunch! Pizza lunchables are my daughters favorite. This is a great idea for an after school snack too. Hi Amanda, I agree we have been using them for a quick lunch or snack over the summer. I love having the little pizza crusts on hand. Do you think you could put the "lunchable" all together and freeze the whole thing, then just pull it out and put it in the lunch kit to thaw in time for lunch? I think I'll try this tonight, but just buy the Great Value Pizza Crust Mix - it's pretty good! The Jiffy dough is so quick and easy. BTW I have never tried to freeze the whole thing. If you try it stop back by and lmk how it went. 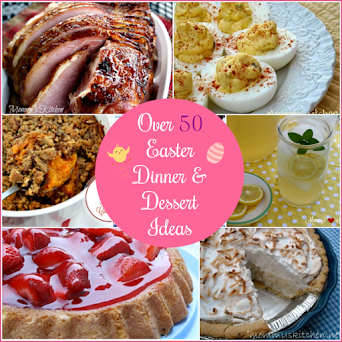 Hi..you are so creative..my kids are grown and have kids of their own..but I still enjoy reading your blog. My boys will love this!!! Thanks for sharing the process! I love your site! I use to do this same thing except I used English Muffins for the crust. You can put them in the toaster first then add the ingredients, microwave to melt cheese. I gave them to my kids after school for a snack. Hmmm, I wonder if you could freeze all the ingredients in their separate baggies and have it work? I never have just 2-3 Tb of pizza sauce, but if I was putting together enough for 9 or 10 meals of this, that would mean the rest of the container wouldn't go to waste. This is such a great idea. My kids also love the lunchable pizzas. I will certainly be using this recipe this year. Thanks for sharing. This is awesome! 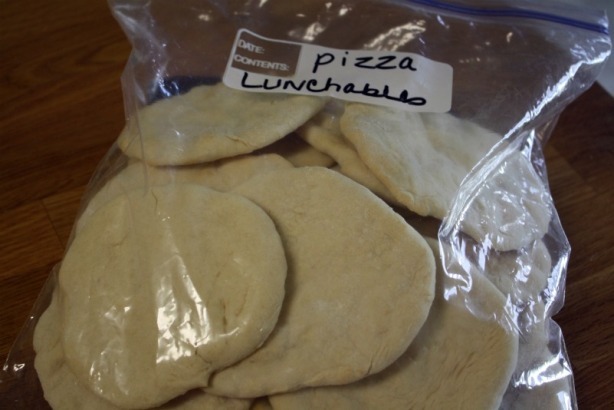 I don't have children yet but I love pizza lunchables! I try not to buy them, though, due to the price & general unhealthiness of it! Can't wait to try this! I'm sure my fiance will love it, too! My daughter would love this idea. She always begs me for lunchables. I think this is a great one for me to prepare for her.Thank you. I have done this for my k-4 before. I used the whole wheat sandwhich rounds as a crust. He loved it! This would also be perfect for the older kids because one lunchable would'nt fill my teen but a few more pizza crusts will! I LOVE this idea! I have 6 children and my 4 oldest boys enjoy the pizza lunchables. Now I can make them and take them. We homeschool so no need to take a lunch. This will be a great timesaver! I LOVE this idea! I have 6 children and my 4 oldest always pick the pizza. What a moneysaver! I will make them for sure! BRILLIANT! So glad I found this. My sons saw it and are so excited. 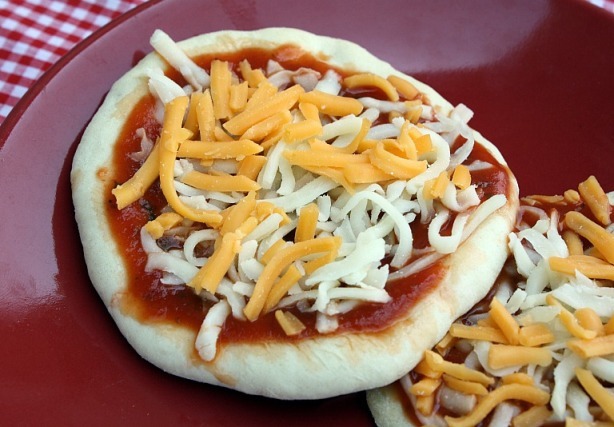 They like the Lunchables, but prefer homemade, so we will definitely be making these! Love this! 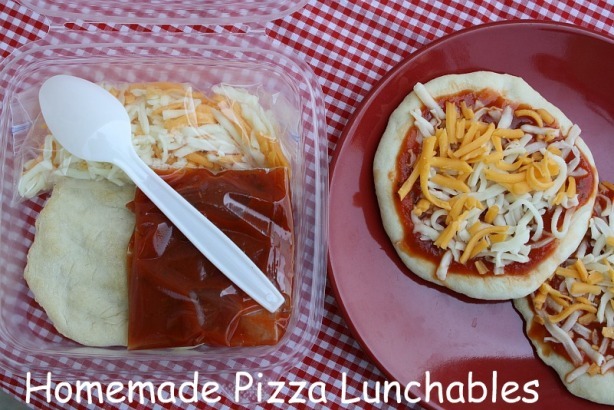 I'm trying to be very frugal this year with lunches, and making our own versions of store-bought favorites, and my second grader LOVES the pizza lunchables! 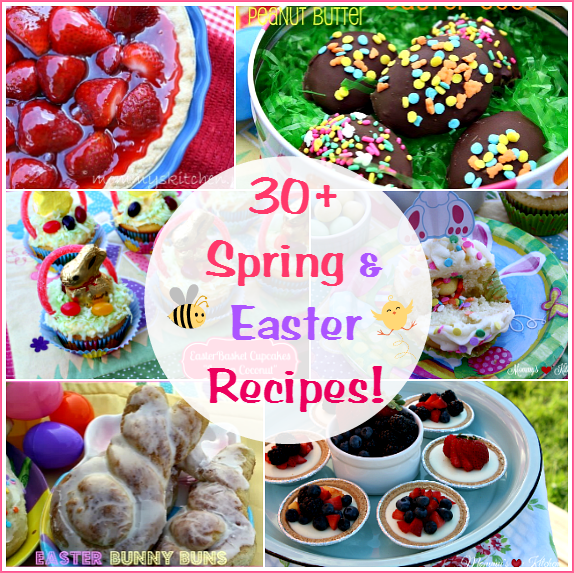 I will definitely be freezing all of these ingredients (separately, probably)! We freeze shredded cheese all the time, and spaghetti/pizza sauce freezes very well also! I also think I may just use tiny containers instead of the baggies - My kid seems to not be able to open a zippy bag without spewing the contents EVERYWHERE! Wow, thanks for the tip. I tried making my own last month by using a full size pizza crust and then adding sauce and cheese. It failed HORRIBLY. Your bright idea should save me some money. BTW, I'm not a parent; I'm almost 30 and never managed to outgrow my taste for lunchable pizzas. No we keep all the little cooked pizza rounds in the freezer. I make up the pizza lunchables the night before school and keep them in the fridge. My little guys eats them cold because they schools do not have microwaves. I made this and wrote about it here. My daughter and I had been arguing about Pizza Lunchables all last year. I knew she wouldn't like how messy they'd be with the cheese uncooked. This was a really inexpensive way to prove this point to her before school started up again. As an added bonus, after proving my point, I had all these quick lunches ready to go this summer. All I needed to do was pop them under the broiler for a few minutes and bam...lunch was ready! I made these before school started to test them out. I have a bunch of the "leftover" crusts in the freezer, ready to be put in the lunchbox. I need to freeze sauce and cheese too. My son LOVED these :) Thank you for sharing! Oh I love the idea of the Pizza lunchable idea. I was thinking of buying my very picky son some, but he only eats the cheese on the crust - so I feel like I get even less for the money paid. I love the idea of making a lot and freezing them. For sandwiches I use cookie cutters too, to make the sandwiches look cuter and it takes the crust off too. I love the crustable cutter thing, but it only works well on giant sized bread (the one I got). We do something similar in our house except we use the Pepperidge Farms 7 grain deli flats for our crust. Each deli flat makes two pizzas. Also I make my own sauce and freeze in ice cube trays. One cube for each pizza. I have never made anything with homemade dough before, but I tried this today and it was a phenomenal failure. I could not work with it and no matter what I did, I could not get the dough to stop being sticky. I followed the instructions exactly. Any idea what went wrong? 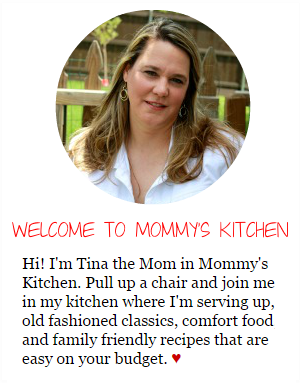 Hi Tina, I stumbled upon your website and thought oh my gosh she's a genius!!!! Here is my dilema and if anyone else has the answer plz feel free to jump on in. I am pretty sure that you are in the states and I am in Canada and our sizes of packaging aren't always the same specifcally the yeast Mine come in three attached packets that say 8g nothing about oz so I would love to make theese for my son but I'm not sure how much yeast to use? 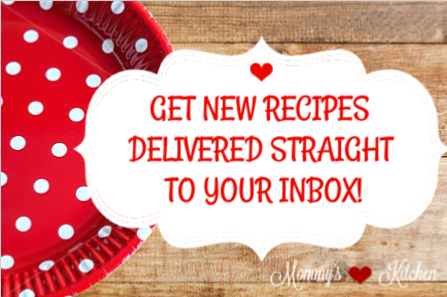 @ #38 - Add more flour to your counter and kneed. Just add flour, a little at a time until the dough is no longer sticky. @ #39 - Each packet of rapid dry yeast is basically 1-1/2 tablespoons. Pretty basic for most dough recipes. I would try it that way. Grab a tablespoon and add. Someone asked if you could freeze pizza sauce. I absolutely do, cause I'd only use a few tablespoons and then the jar was going to waste, it drove me batty. So now when I open a new jar I spoon two tablespoons into the snack size baggies and put all the little bags into a big one to keep them from wandering around the freezer. 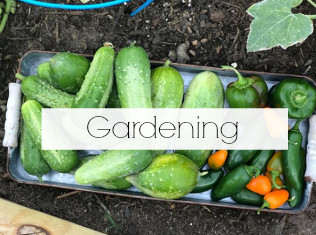 Take them out and put in a bowl of warm water for a few minutes and they are ready to go! I just made these, and they turned out wonderful. What a great basic pizza dough recipe. Thank you! The only change I made was to pierce the little rounds with a fork after rolling them out. The "real" crusts in a Lunchable have these little holes, and I think that little extra touch helped. Thanks again! We cooked the bit of our last dough that wasn't used for the family pizza into rectangles to go in my new kinder's lunch tomorrow. If she doesn't come home a mess tomorrow, next time I'll make a batch of circles for her. Great idea!! I pulled my first batch of crusts out of the oven a few min ago and they look great. :) My son is a teen, so he'll eat 4 of these as a meal but what a money saver! Because I have never bought a lunchable, how does the whole pizza crust work, as far as, do you heat It up before putting it in lunchbox? hi - im not sure if you are still accepting comments - just found this and this is my 3rd batch! but question... my about half of my crusts bubble, like a pita would... any idea how to stop that? Thanks Tina.What's Best Suggestion for vegetarian. 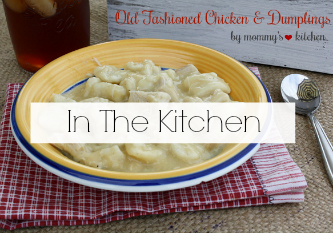 I have frozen everything in this recipe minus the dough. It all thaws perfecty. I half-bake the crusts, then freeze and vacuum-seal them four to a package. My eldest just pops them into the toaster oven at 350 for about five minutes. They come out perfect.